Regulatory Requirements | EuroRisk Systems Ltd.
Credit Risk measurement and management, according to Basel III. The Credit Risk Module for Basel III is based on the EU Regulation (No 575/2013 of the European Parliament and of the Council from June 26th, 2013) on prudential requirements for credit institutions and investment firms, and amending Regulation (EU) No 648/2012. Market Risk measurements and management, according to Basel III. The Market Risk Module for Basel III is based on revisions to the Basel II market risk framework of the Basel Committee on Banking Supervision, July 2009. Operational Risk measurements and management, according to Basel III. The Operational Risk Module for Basel III is based on revisions to the Basel II operational risk framework of the Basel Committee on Banking Supervision, July 2009. Self-assessment Questionnaires (SAS), according to Basel III. SAS are developed for different categories (Asset Damage, Execution Delivery, System Failure, Business Practice, Internal and External Fraud, Employment Practice). Insurance Risk, according to Solvency II. The Solvency II Module is based on the QIS5 technical specifications from July 5th, 2010, concerning financial institutions, insurance and pensions. The specification includes market, default and life underwriting risk. Analysis of country specific regulations, adjustment of models and reports, preparation of export files. Import of data, directly from a bank’s core database or via the standard importer. Classification and analysis of the imported data. Running of batch procedures and calculation according to specific regulations. Generation of COREP output and aggregation of results. 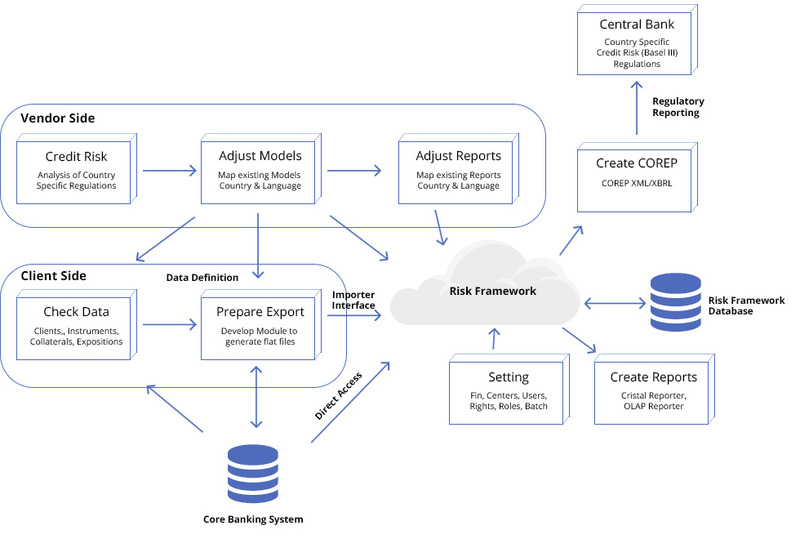 Reporting to the Central Bank or to a regulation advisory, using COREP XML/XBRL. The assignment, calculation, management and optimisation of collaterals are important aspects for credit risk calculations. An exposure claim can partially be protected on a percentage basis by a set of different collaterals, e.g. cash deposits, securities or guarantees. One approach is the credit quality replacement, where the better part of the credit quality covers the exposure’s bad credit quality (better rating and smaller probability of default). The derivation of the credit rating starts from the exposure rating. If not available, issuer rating is taken into account. If this, too, is not available, country rating can be applied. In some cases, both country and issuer rating apply. The Regulatory Requirements Module inherits the features of Risk Framework Interfaces and Connectors. Combining our comprehensive financial knowledge with over 20 years of experience in Information Technology, we offer products for analysis, modeling, evaluation, simulation and optimization of financial instruments and portfolios.